The Enquirer is regarded as a conservative, Republican-leaning newspaper, in contrast to The Cincinnati Post, a former competing daily. From 1920 to 2012, the editorial board endorsed every Republican candidate for United States president. By contrast, the current editorial board claims to take a pragmatic editorial stance. According to editor Peter Bhatia, "It is made up of pragmatic, solution-driven members who, frankly, don’t have much use for extreme ideologies from the right or the left. ... The board’s mantra in our editorials has been about problem-solving and improving the quality of life for everyone in greater Cincinnati." On September 24, 2016, the Enquirer endorsed Hillary Clinton for president, the first endorsement of a Democrat for president since Woodrow Wilson in 1916. Since September 2015, the Enquirer and local Fox affiliate WXIX-TV have partnered on news gathering and have shared news coverage and video among the paper, broadcasts, and online media. In March 2013, Gannett closed its West End printing facility and contracted with The Columbus Dispatch to print the Enquirer in Columbus. Shortly after, the Enquirer began publishing in a smaller compact format. Former Post and Enquirer pressman Al Bamberger purchased the former Enquirer facility that June and sold it to Wegman Company, an office furniture installation comapny. Archives of Enquirer articles can be found in online subscription databases. ProQuest contains full text of articles from 1841 to 1922 and from 1999 to present, as well as "digital microfilm" of articles from 2010 to 2012. 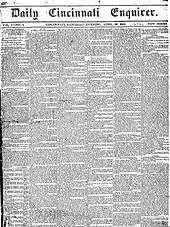 As of September 2016, Newspapers.com has scans of 4.2 million pages from 1841 to present. ↑ "One Gannett: 2015 Annual Report" (PDF). Gannett Company. p. 10. Average 2015 circulation includes print and digital replica and non-replica readership. ↑ McCarty, Mary (March 1985). "What Makes Them Think They're So Smart?". Cincinnati. Vol. 18 no. 6. CM Media. pp. 41–48 – via Google Books. Conventional wisdom has it that The Enquirer is the ultraconservative, till-death-do-us-part Republican Party mouthpiece, while The Post is the moderate, working-class, comparatively progressive paper. 1 2 Bhatia, Peter (2016-09-23). "Why we're endorsing for president". The Cincinnati Enquirer. ↑ "Editorial: It has to be Hillary Clinton". The Cincinnati Enquirer. 2016-09-24. ↑ "Page and Photo Reprints". Cincinnati.com. Gannett Company. Retrieved September 26, 2016. ↑ Kiesewetter, John (September 15, 2016). "Enquirer-WXIX-TV News Sharing Agreement Finalized". WVXU. Cincinnati Public Radio. Retrieved October 2, 2016. 1 2 Horn, Dan; Suess, Jeff (April 10, 2016). "First Enquirer reveals much about Cincinnati". The Cincinnati Enquirer. Gannett Company. Retrieved September 26, 2016. ↑ "About Advertiser and journal. (Cincinnati, Ohio) 1839-1841". Chronicling America. National Digital Newspaper Program. Retrieved September 26, 2016. ↑ "About Weekly Cincinnati enquirer. (Cincinnati [Ohio]) 1841-1842". Chronicling America. National Digital Newspaper Program. Retrieved September 26, 2016. 1 2 3 Nelson, S. B; Runk, J. M., eds. (1894). History of Cincinnati and Hamilton County, Ohio; Their Past and Present. S. B. Nelson & Company. p. 385 – via Internet Archive. ↑ "About Enquirer and message. (Cincinnati [Ohio]) 1843-1844". Chronicling America. National Digital Newspaper Program. Retrieved September 26, 2016. ↑ "About Daily enquirer and message. (Cincinnati [Ohio) 1844-1845". Chronicling America. National Digital Newspaper Program. Retrieved September 26, 2016. ↑ "About The Cincinnati daily enquirer. (Cincinnati [Ohio]) 1845-1849". Chronicling America. National Digital Newspaper Program. Retrieved September 26, 2016. ↑ "About The Cincinnati enquirer. (Cincinnati [Ohio]) 1849-1852". Chronicling America. National Digital Newspaper Program. Retrieved September 26, 2016. ↑ Suess, Jeff (July 15, 2015). "Tragedy of Pike's Opera House recounted in new book". The Cincinnati Enquirer. Gannett Company. Retrieved September 26, 2016. 1 2 "The Press: Battle for the Enquirer". Time. Vol. 59 no. 23. Time Inc. June 9, 1952. Retrieved October 30, 2016. ↑ Harrington, Harry Franklin; Frankenberg, Theodore Thomas (1912). Essentials in journalism: a manual in newspaper making for college classes. Ginn and Company – via Internet Archive. ↑ "Death of John R. McLean: his estate of millions left in trust for son and descendants". The Fourth Estate (1164). Fourth Estate Publishing Company. June 17, 1916. pp. 12–13 – via Google Books. ↑ "Knights of the Golden Trail". Historic Loveland Castle Museum. July 18, 2002. Retrieved July 5, 2007. ↑ Cincinnati Enquirer v. Amer. Security & Trust Co. , 107 Ohio App. 526 (Ohio App. 1958). ↑ "Employees Bid for Paper: Staff of The Cincinnati Enquirer Seeks to Purchase Daily". The New York Times. The New York Times Company. March 21, 1952. p. 25. ↑ "Employee Paper Thrives: Cincinnati Enquirer Has Net of $349,421 Under Staff". The New York Times. The New York Times Company. January 3, 1954. p. 40. ↑ "Newspaper Staff Stages a Revolt". The New York Times. The New York Times Company. November 26, 1955. p. 16. ↑ "2 Ousted in Dispute on Cincinnati Paper". The New York Times. The New York Times Company. December 5, 1955. p. 24. ↑ "36% of Cincinnati Enquirer Stock Sold to Affiliate of Scripps Chain; Chicago Investment House Accepts Its Offer of $4,059,000 for Debentures—Two Other Papers Also Bid". The New York Times. The New York Times Company. Associated Press. April 27, 1956. ↑ Taft 1960, pp. 270–274. ↑ "The Press: Death of the Times-Star". Time. August 4, 1958. Retrieved November 17, 2014. ↑ Murtha, Lisa (November 8, 2014). "Scripps: Once, They Bought Ink by the Barrel". Cincinnati. Emmis Communications. Retrieved November 23, 2014. ↑ "Newspapers: Separation in Cincinnati". Time. October 11, 1968. Retrieved November 23, 2014. ↑ Clark, Paul (December 28, 2007). "Post won PM market before decline". The Cincinnati Enquirer. Gannett Company. Retrieved December 29, 2014. ↑ "Scripps O.K. 's Sale of Enquirer Control". Chicago Tribune. 124 (31). United Press International. February 20, 1971. p. 2:7. ↑ "Cincinnati Enquirer Brings $30 Million". Associated Press. May 6, 1975. p. 80. 1 2 Peale, Cliff (January 17, 2004). "Post pact will expire". The Cincinnati Enquirer. Gannett Company. Retrieved November 19, 2014. 1 2 Dillehay, Whayne (October 1978). "How To Succeed In Newspapering Without Really Trying". Cincinnati. Greater Cincinnati Chamber of Commerce. 12 (1): 77–81, 123–127. ↑ "Joint Operation Backed For 2 Cincinnati Papers". The New York Times. The New York Times Company. Associated Press. November 27, 1979. ↑ Driehaus, Bob (February 21, 2007). "Cover Story: The Deal That Changed Everything". Cincinnati CityBeat. Retrieved November 17, 2014. 1 2 3 Lambert, Lance (April 19, 2014). 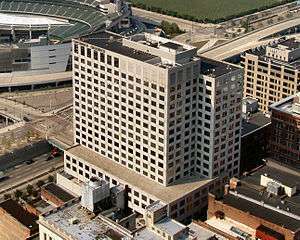 "Former Enquirer printing building sold again". The Cincinnati Enquirer. Gannett Company. Retrieved September 26, 2016. ↑ Robson, Britt (April 1983). "The Man Behind the News: What Is He Really Aiming For?". Cincinnati. Vol. 16 no. 7. CM Media. Cover, pp. 34–39 – via Google Books. 1 2 3 4 Zimmerman, Julie Irwin (June 2008). "Enquirer 2.0". Cincinnati. Vol. 41 no. 9. Emmis Communications. pp. 99–103, 174–176 – via Google Books. 1 2 Vaccariello, Lina; Tate, Skip (October 1998). "The rise and fall of an editor, a reporter, and a newspaper". Cincinnati. Vol. 33 no. 1. Emmis Communications. pp. 112–114, 153–168. ISSN 0746-8210 – via Google Books. ↑ Gallagher, Mike; McWhirter, Cameron (May 3, 1998). "Chiquita SECRETS Revealed". The Cincinnati Enquirer. Gannett Company. ↑ Fox, John (May 11, 2000). "Press Clips: Two Years and Counting". Cincinnati CityBeat. Retrieved October 30, 2016. ↑ Oberlander, Lynn (July 28, 2011). "The Chiquita Phone-Hacking Scandal". The New Yorker. Condé Nast. ↑ "News for the New Century". Cincinnati.com. Gannett Company. Retrieved November 24, 2014. ↑ Bushee, Ward (April 9, 2000). "Enquirer launches new look". The Cincinnati Enquirer. Retrieved December 29, 2014. 1 2 "Callinan to retire as Enquirer editor". Cincinnati Business Courier. American City Business Journals. November 23, 2010. Retrieved October 31, 2016. ↑ Howe, Jeff (July 24, 2007). "To Save Themselves, US Newspapers Put Readers to Work". Wired. Vol. 15 no. 08. Condé Nast. Retrieved October 31, 2016. ↑ "Stealth CEO". Cincy. February–March 2006. Retrieved October 31, 2016. ↑ "Enquirer parent to buy Community Press/Recorder owner". Cincinnati Business Courier. American City Business Journals. November 19, 2004. Retrieved October 2, 2016. ↑ "Gannett gets OK to buy Community Press/Recorder". Cincinnati Business Courier. American City Business Journals. March 8, 2005. Retrieved October 2, 2016. ↑ "Newspaper JOA in Cincinnati will not be renewed after 2007" (Press release). E. W. Scripps Company. January 16, 2004. Archived from the original on July 16, 2011. ↑ Winternitz, Felix; Bellman, Sacha DeVroomen (November 18, 2008). Insiders' Guide to Cincinnati (7th ed.). Globe Pequot Press. p. 381. ISBN 0-7627-4180-5. ISSN 1527-1188. Retrieved August 1, 2013. 1 2 Lopez, German (August 2, 2013). "'Enquirer' Restructures Kentucky, West Chester Offices". Cincinnati CityBeat. SouthComm. Retrieved October 2, 2016. 1 2 Wetterich, Chris (February 18, 2015). "Enquirer publisher retires, this former editor will replace her". Cincinnati Business Courier. American City Business Journals. Retrieved October 31, 2016. 1 2 "Cincinnati Enquirer unveils new paper format". WCPO. 13 March 2013. Retrieved 19 February 2015. ↑ Kiesewetter, John (September 6, 2016). "The End Of An Era At The Enquirer". WVXU. Cincinnati Public Radio. Retrieved October 2, 2016. ↑ "Enquirer drops publisher position". Cincinnati Business Courier. American City Business Journals. September 6, 2016. Retrieved October 2, 2016. ↑ Kenny, Daniel J. (1879). Cincinnati Illustrated: A Pictorial Guide to Cincinnati and the Suburbs. Robert Clarke & Company. p. 81 – via Google Books. ↑ Owen, Lorrie K., ed. Dictionary of Ohio Historic Places. Vol. I., St. Clair Shores: Somerset, 1999, 574. ↑ About Us, The Cincinnati Enquirer, 2008. Accessed 2010-12-03. ↑ Brownfield, Andy (August 2, 2013). "Enquirer restructures bureaus, lays off journalists". Cincinnati Business Courier. American City Business Journals. Retrieved October 2, 2016. ↑ "Gannett to switch community papers' printing; cut 31 jobs". Cincinnati Business Courier. American City Business Journals. January 22, 2007. Retrieved October 2, 2016. Gannett Company Inc. is eliminating 31 jobs in the former Community Press newspaper operation as it transfers the printing of its 27 neighborhood newspapers to a Gannett paper in Lafayette, Ind., and moves to a new page format. The move affects all Community Press and Community Recorder newspapers in the Tri-State, as well as several specialty publications that used the Para Drive printing plant in Bond Hill. ↑ Brewer, Charles (October 27, 1996). "Most papers tiptoeing onto Internet". The Cincinnati Enquirer. Gannett Company. ↑ "Other U.S. Cities". GoCinci.Net Internet Access. Gannett Company. 1997. Archived from the original on June 6, 1997. ↑ Eckberg, John (November 1, 1998). "GoCincinnati gets a new name". The Cincinnati Enquirer. Gannett Company. Retrieved December 29, 2014. ↑ "Web site has a new address". The Cincinnati Post. E. W. Scripps Company. October 31, 1998. Archived from the original on November 23, 2004. ↑ "Welcome to WCPO.com!". WCPO.com. E. W. Scripps Company. Archived from the original on May 5, 2012. ↑ Wang, Shan (August 27, 2015). "A Cincinnati TV station with a paywalled site is challenging the city's leading daily newspaper". Nieman Journalism Lab. Nieman Foundation for Journalism. Retrieved September 26, 2016. ↑ "Magazine & Newspaper Articles". Public Library of Cincinnati and Hamilton County. Retrieved September 26, 2016. ↑ "The Cincinnati Enquirer". Newspapers.com. Retrieved September 26, 2016. ↑ "'Zits' cartoonist Borgman takes Ohio newspaper buyout". USA Today. Gannett Company. September 3, 2008. Retrieved October 2, 2016. ↑ "Cartoonist Borgman to leave Enquirer". Cincinnati Business Courier. American City Business Journals. September 3, 2008. Retrieved October 2, 2016.